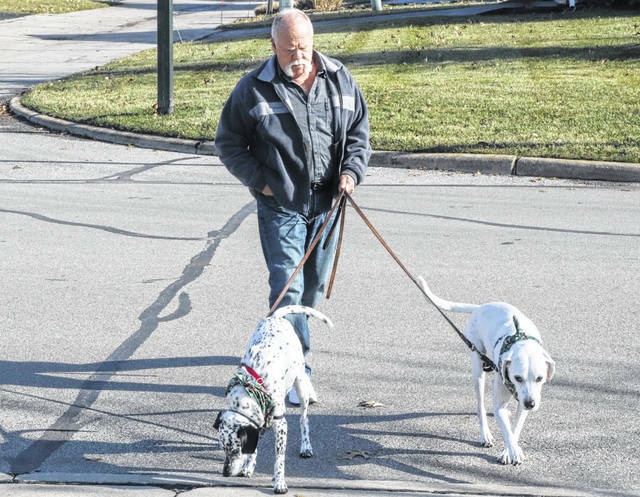 Chuck Stenger walks his two dogs around his neighborhood. Chuck is the first person in the U.S. to receive the Calypso Knee System, an implant designed to relieve knee pain caused by osteoarthritis and prevent or delay the need for a total knee replacement. The Calypso Knee System, developed by Moximed, Inc., is designed to act as a shock absorber for the inner knee. A clinical trial is examining how the device may relieve pain and slow the progression of osteoarthritis. 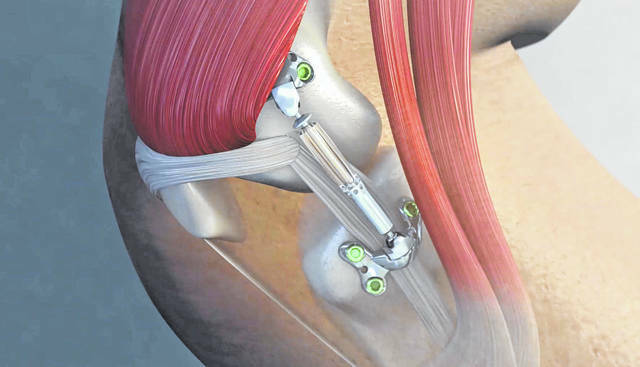 COLUMBUS, Ohio – Surgeons at The Ohio State University Wexner Medical Center are the first in the U.S. to implant a new device designed to relieve knee pain and help people with osteoarthritis prevent or delay knee replacements. For the millions who suffer with the daily pain and stiffness of osteoarthritis, treatments to slow the progression of the disease are limited. A clinical trial is testing the Calypso Knee System and the device’s ability to extend the functional life of the joint, thus allowing patients to remain active without knee pain. Knee osteoarthritis occurs when cartilage in the joint wears away, causing stiffness and pain that continues to get worse with time. Current treatment options, largely for end stage osteoarthritis, often involve invasive surgical procedures that permanently change the knee structure. While effective, removing bone or tissue can limit patients’ future treatment options. Moximed is funding the research. To learn more about this clinical trial, go to: http://go.osu.edu/ChhG. Submitted by The Ohio State University Wexner Medical Center.